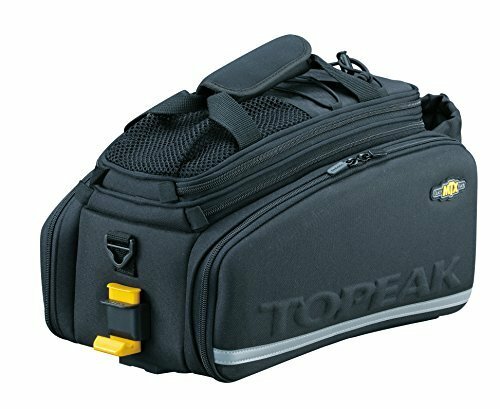 Topeak, one of the leaders in the field of cycling accessories, has a variety of well-designed bags as part of its MTX Trunk Bag series. The larger size is the DX model, and Topeak calls the slightly smaller version its EX model. Both are available with or without panniers. I have used the MTX Trunk Bag DX for the past six months, mostly as gear for my daily commute. The bag is well-constructed and well designed, and contains a number of features that make it ideal for this purpose as well as other uses that require hauling stuff that you want to keep protected and secure. Here, I’ve noted few things to look below the Topeak MTX Trunkbag DXP review. The MTX TrunkBag DX somehow manages to be both soft-sided and cushiony, yet plenty stiff to protect contents and not lose its shape. With rigid foam construction in the walls, the main storage area has some good insulating qualities. I use it to tote my lunch, and you could probably keep a cold six-pack in there for an hour or more. The MTX TrunkBags are intended to be used in conjunction with one of Topeak’s racks﻿﻿﻿ via the QuickTrack system, a nifty design that eliminates the need to lash stuff down with bungee cords. A track built into the base of the bag fits neatly into a corresponding groove on the rack, and an easy-to-use clip holds the bag securely so that your stuff doesn’t tumble off when you’re riding down the street. This set-up allows you to remove the bag in mere seconds, simply sliding it off the rack to take it with you. With this quick attach/detach system, as well as built in carrying handles, detachable shoulder strap and optional rain cover, the MTX TrunkBag DX is almost like a briefcase for the bike commuter. In addition to the main pouch, three other decent-sized pockets on the top and side offer additional options for stashing your stuff. Capacity of the MTX TrunkBag DX is listed at 800 cubic inches, with an expanding lid that increases the size of the main storage area and bungee straps on top of the bag that allow you to stow stuff there for even more carrying capacity. The biggest downside to this bag (or most any bag, for that matter) is going to be the extra weight. When used in conjunction with a Topeak's MTX Beam Rack, you're putting over four pounds extra on your bike. And that's even before you add the first brown bag peanut butter-and-jelly sandwich. Certainly, that's not like trying to pedal dragging a big back of rocks behind you. But given where this weight sits -- up relatively high and back on your bike -- you will notice at once the difference in how your bike handles at once. You'll feel more top-heavy, with much more weight centered over your rear wheel. If I were the designer of the MTX TrunkBag, the only thing I might have done differently is in the positioning of the zippers on the main compartment. The zipper to open and close the pouch is side-by-side and pretty much indistinguishable from the zipper that allows the compartment to expand, and most days I tried the wrong one first. In fairness to Topeak, there is a small yellow Topeak logo on one side of the zipper pull for the main compartment. But I had never noticed the difference until I started to scrutinize the bag for this review. A good, simple technique that solves this matter: simply zip the two compartments closed to opposite sides of the bag. After doing this a couple of times, knowing which one you want is easy. Fortunately, the fix is simple - a piece of colored yarn through one or the other, to help you tell 'em apart. It's just a matter of getting around to doing it, kind of like tying a ribbon around the handle of your suitcase to differentiate it between the other 12,000 black bags on the carousel at the airport. And no, I haven't done that yet either. But if that's the biggest flaw a guy can find after using the bag for six months, it must be a pretty good product. And I do recommend it to you. I use this gear regularly in my commute, and it serves me well. It is well constructed and continues to impress me with thoughtful and innovative design features. Just remember that the bag is not much good by itself though. If you do opt to go with a Topeak bag, you'll need a Topeak Quick Track compatible rack to go with it.